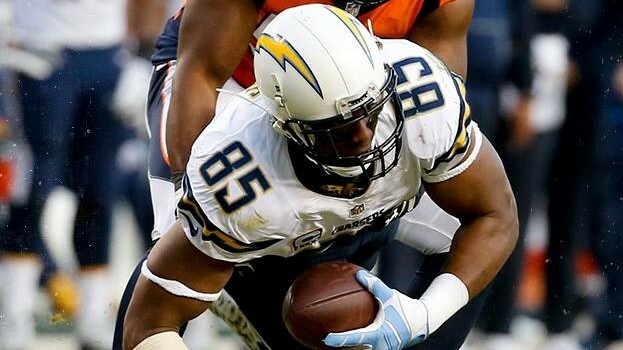 Antonio Gates hauls in a pass in the team’s loss to the Denver Broncos Sunday. Courtesy of San Diego Chargers Facebook. Despite an array of injuries to an already beat up team, the Chargers gave the Broncos a scare but ultimately loss 27-20 in the season finale in Denver Sunday. The Chargers (4-12) finished without a divisional win for the first time in 31 years and finished with their worst record since 2003. After giving up a 72-yard touchdown to Demaryius Thomas on the game’s opening possession, the defense forced turnovers on four of the next five drives. Steve Williams was a big contributor with two forced fumbles, a fumble recovery, a sack and an interception in that span. Philip Rivers and the offense weren’t able to capitalize on the turnovers, though, ending the half with six points. 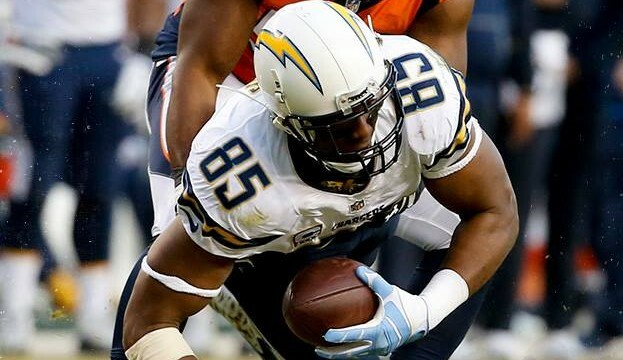 Rivers found Antonio Gates in the corner of the end zone for a 13-yard touchdown on the second possession of the second half to give the Chargers a 13-7 lead, which prompted the Broncos to bring in Peyton Manning, who had missed the last six games. The Chargers took a 20-17 lead in the fourth quarter after a busted coverage left wide receiver Tyrell Williams open for an 80-yard touchdown. After a field goal tied the game, Rivers threw an interception behind Williams’ route, which led to the game-winning touchdown from Broncos running back Ronnie Hillman. Rivers finished the contest 21-for-35 with 228 yards and two touchdowns to go with the interception. Williams only had two catches, but led the team with 90 yards and a touchdown through the air. The defense had flustered Denver starting quarterback Brock Osweiler, holding him to seven points into the third quarter when he was replaced. Denver scored 20 points under Manning’s direction, although both touchdowns the team scored while he was in were rushing touchdowns. With the loss, the Chargers officially have the No. 3 pick in the 2016 NFL Draft. The team is expected to file for relocation and decide on the future of head coach Mike McCoy on Monday.